FORT MCCOY, WISCONSIN (06/23/2017) (readMedia)-- U.S. Army snipers in the National Guard are highly trained assets that are often overlooked during large scale training events such as the National Guard's eXportable Combat Training Capability. Staff Sgt. Joe Bastian, a sniper observer/controller/trainer with First Army's 1st Battalion, 335th Infantry Regiment and former active-duty sniper wants to help change that. Bastian designed and implemented a 10-day sniper training course during the 33rd Infantry Brigade Combat Team's XCTC training rotation at Fort McCoy, Wisconsin, June 4 through 24. Nearly 30 Soldiers from Illinois' 33rd IBCT and Puerto Rico's 1st Battalion, 296th Infantry Regiment participated in the course. "The course is designed to get all of the snipers from the brigade together to train, broaden their horizons and share tactics, techniques and procedures," said Bastian. "Sharing knowledge in this manner is paramount to operational success and allows them to become masters of their craft." Bastian said that the course packs weeks of information and training into a 10-day period. 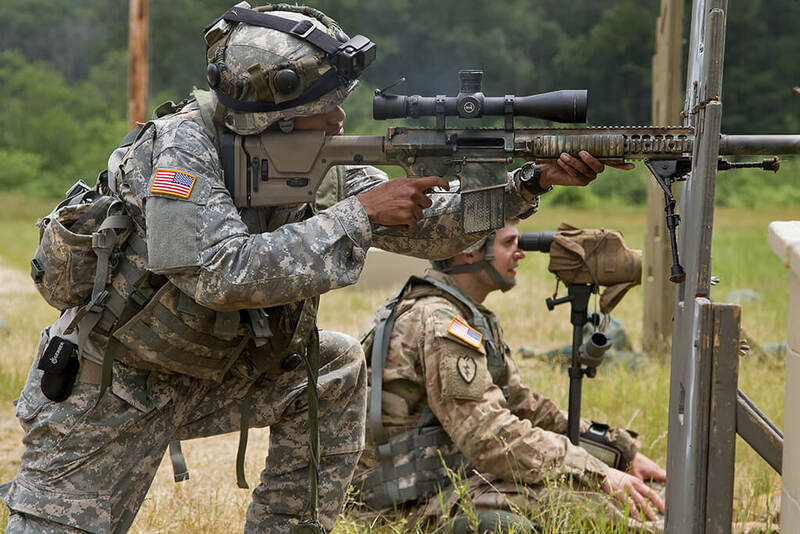 He enlisted the help of two former instructors at the U.S. Army's Sniper School in Fort Benning, Georgia: Mr. Tarrol Peterson, a U.S. Army Sniper Association instructor, and Staff Sgt. John Brady, a sniper instructor at the 10th Mountain Division's Light Fighter School at Fort Drum, New York. "I had to call in a couple of favors because of the scope of this course," said Bastian. "My two co-trainers bring a breadth of knowledge and experience that is unparalleled and gives these Soldiers an opportunity that they won't get otherwise." Peterson said the training course is invaluable to the snipers that go through it. "It's immensely important to train and have courses like this," said Peterson. "The Army has a multitude of systems and professionals to continually train everyone, except snipers. When these guys go back to their units, there's not a lot of personnel that can train them properly. This course will help them continue their education and properly train themselves." Peterson said the course will teach the 33rd's snipers how to design and implement their own training, forecast ammunition, set up targets and ranges and properly train in camouflage and stalking techniques. Brady reiterated his colleagues' opinion of the course. "It's a necessity to have a program like this," said Brady. "It's a force multiplier getting multiple sniper teams together to train and gain the knowledge they need for success. Over this 10-day period they'll realize how much work it will take them to learn how to conduct their own training and we'll give them the knowledge they need to do so." Brady said he's never seen a program of this scope done in the National Guard. "On active duty we try to get different sniper teams together on the same range to share knowledge," said Brady. "Other than in competitions, I haven't seen this many snipers, active or Guard, on the same range." Staff Sgt. Jesse Poplowski of Mundelein, Illinios, a sniper section leader with Troop C, 2nd Squadron, 106th Cavalry Regiment based in Aurora, Illinois, said the course is valuable on multiple levels. "This course gives our new snipers, the guys who haven't been to school yet, an opportunity to learn from the best and will give them a head start when they do go to Fort Benning," said Poplawski. "It also gives the team leaders and the sniper qualified guys much needed practice and an opportunity to get ideas from an incredibly knowledgeable group of instructors." Sgt. Robert Zatorski of Romeoville, Illinois, a sniper with Headquarters and Headquarters Company, 1st Battalion, 178th Infantry Regiment based in Chicago, said he enjoyed the 10-day course. "This was an absolutely outstanding training course," said Zatorski. "The snipers out here have gotten a lot of trigger time and time in the field to build our skills and collect data." Zatorski said that the training that he and his team received was invaluable. "We haven't been to sniper school yet," said Zatorski. "This is priceless training, it's going to make us that much better when we do go to sniper school." Zatorski's teammates, Spc. Kevin Pollack of Elk Grove Village, Illinois, and Spc. Sean Jones of New Lenox, Illinois, said they'll take away valuable training exercises that they can do at no cost back at the unit and look forward to having more opportunities like this.